Partall Paste #2, the original green wax, is an economical paste wax mold release formulated with hydrocarbon and microcrystalline waxes. Designed as a general purpose mold release agent on fiberglass and metal molds as a smooth compatible prime coat for PVA coatings – such as Partall Film # 10 and Partall Coverall Film – or as an effective stand – alone release agent where standard silicone wax releases cannot be tolerated. Available in green or clear in 1.5 lb. (new metal cans reduce solvent loss and increase shelf life), 7 lb., 25 lb. and 200 lb. containers. 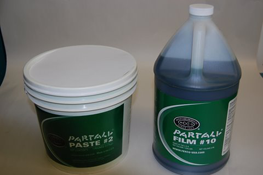 Partall Film # 10 is a water/alcohol-based polyvinyl alcohol (PVA) mold release agent that forms a barrier between parts and mold surfaces that are still curing (green or recently reconditioned molds can be reactive). Partall Film # 10, the original green parting film, is resistant to solvents and styrene yet is water soluble. Protects against mold hang ups with polyester and vinylester resins; also used with epoxy and urethane resins. PVA is most commonly applied over mold release wax although some users find success by adding wax over the PVA film (giving a second part cycle before replacing PVA>) Partall Film # 10 can also be used as a surface cure agent during gel coat repairs (locks out moisture in the air that inhibits resin cure). Now improved for easier lay out, Partall Film # 10 allows application by brush, roller, sponge or cloth as well as excellent spray characteristics. Available in green and 1 liter or 1 gallon sizes.